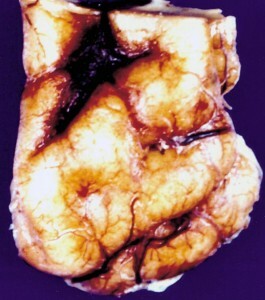 A ganglioglioma is low-grade tumor of mixed cell type. This type of tumor contains properties of both glial cells (responsible for providing the structural support of the central nervous system) and neuronal cells (the functioning component of the central nervous system). These tumors are rare. They occur most commonly in the cerebrum (the largest and upper most section of the brain), but may occur in any part of the brain and spinal cord. These tumors may rarely undergo transformation into a higher grade, more malignant tumor. Due to the relative slow growth rate of gangliogliomas, children with these tumors tend to present to the doctor with symptoms that have been occurring for many months. Some children, however, will have a more sudden onset of symptoms. The following are the most common symptoms of a ganglioglioma, however each child may experience symptoms differently. 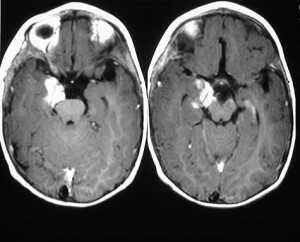 computerized tomography scan (also called a CT or CAT scan) – For ganglioglioma, a CT scan of the brain is usually done. magnetic resonance imaging (MRI) – For ganglioglioma, an MRI of the brain and spine is usually done, to find out the extent of tumor and for planning appropriate therapy. Management may be complex due to difficult-to-control seizures. May require a neurologist specializing in epilepsy. 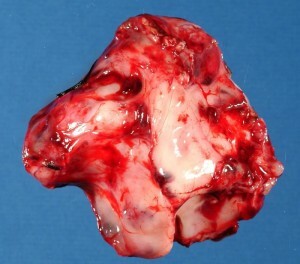 For tumors near language areas of the brain, obtaining a complete resection can be challenging. Gangliogliomas are best removed with the aid of intra-operative neuronavigation allowing the most complete, safest surgery possible. Exact mapping of the most important brain regions may require part of the operation to be performed while you are awake. We have special expertise in this challenging technique.